The low-cut iterations of the Air Jordan 11 are undoubtedly one of the brand’s most popular silhouettes. Its simplistic design, sporadic releases and iconic colourways have made it an enduring hit over the years, and this season, it returns in the highly-coveted ‘Snakeskin’ iteration. Designed by no other than Tinker Hatfield – the legendary Nike footwear specialists responsible for the iconic Air Jordan 3 – the 11th Jumpman silhouette landed in 1996 and is said to have been inspired by a yellow lawn mower and a convertible. After catching wind of this, people knew it was going to something very different from its predecessors, and featuring in the ’90s blockbuster ‘Space Jam’ only helped to elevate the hype even further. First hitting the shelves back in 2001, the reptile-inspired ‘Snakeskin’ edition returns for 2019. The lavish-looking shoe is kitted out with scaly, textured panels in varying hues of navy blue and black. Below, a solid white midsole pairs perfectly with the shoe’s uppers, and Air technology is encased within to provide you with supreme levels of cushioning. One finishing touch: a translucent icy outsole ensure reliable traction on and off the courts. 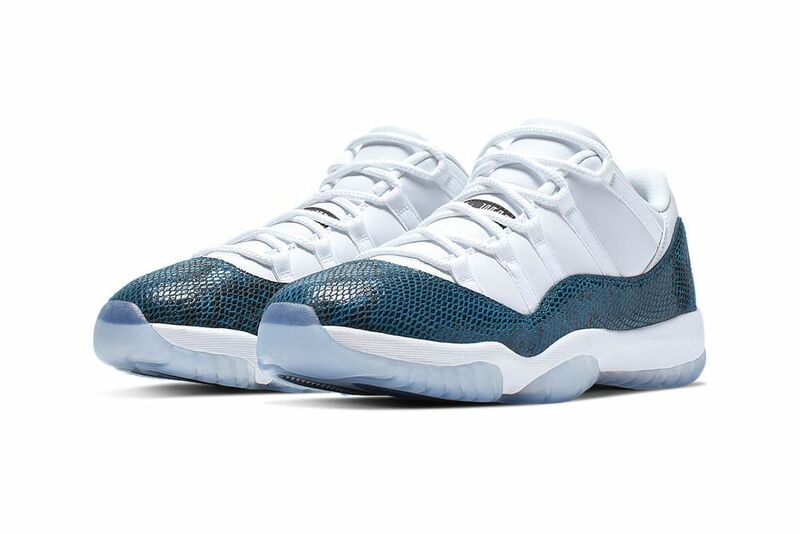 The Air Jordan 11 ‘Snakeskin’ Navy Blue will be available via the size? previews app and in selected size? stores, priced from £95 – £155.